The University of London (UoL) has redeveloped its intercollegiate accommodation in Cartwright Gardens. Garden Halls provides high-quality, affordable accommodation to students from across the UK and around the world. As part of the development, UoL has refurbished and opened up the gardens opposite the halls to the public so that they can be enjoyed by everyone. The Community Liaison Group (CLG) provided an essential link with local people through their representative throughout the construction phase of the development. Now that the halls are in operation, the representatives continue to meet and engage with local aspects of the development. As a result, the project team achieved a high score under the Considerate Constructors Scheme and the halls play a central role within the local community. The activity of the CLG has evolved with the development. Initially the CLG consulted on the various management plans associated with the construction of the development. 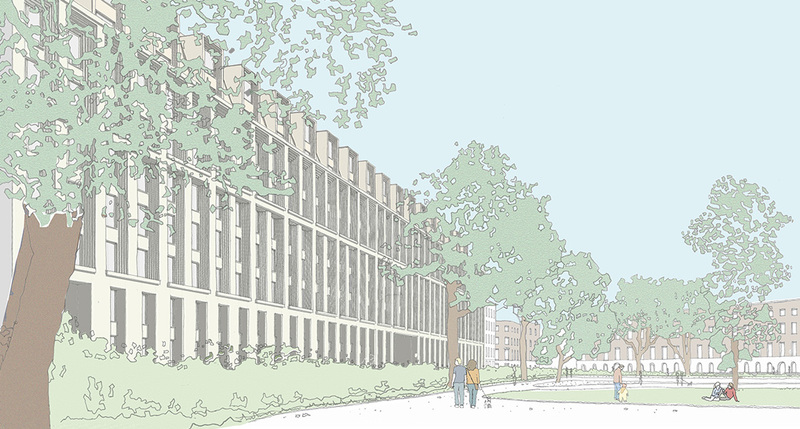 During construction, the CLG provided feedback on any issues of concern directly to the UoL and the contractor regarding the work being done and the impact on the surrounding area. Now that the Garden Halls are operational the CLG is able to comment on their management and address any issues of common concern to local stakeholders. Details of meetings can be found below. For further information or if you have an issue you would like the CLG to discuss please get in touch with the group’s Community Liaison Officer using the details below.